They say travel is one of the best investments you can make for a life-enriching experience. Though when you’re on a budget, it’s harder to make that investment. Airfare can often be the most expensive thing that stops people from travelling. So, here are our best tips on how to save on airfare in order to afford that wanderlust. This is essential because of little things called web cookies. Cookies are bits of data sent from a website you’re using that are stored through your web browser. Basically, this is how websites seem to remember things about your browsing history and show you specific content accordingly. So, the first step in searching for flights should always be to open an incognito browser window. This way your information won’t be tracked so you can see the lowest prices. While in Google Chrome or Safari, you can open a new incognito window by hitting these keys: Command (or “Control” if using PC), Shift, and “N”. For Firefox or Internet Explorer, hit Command (or “Control” if using a PC), Shift, and “P”. 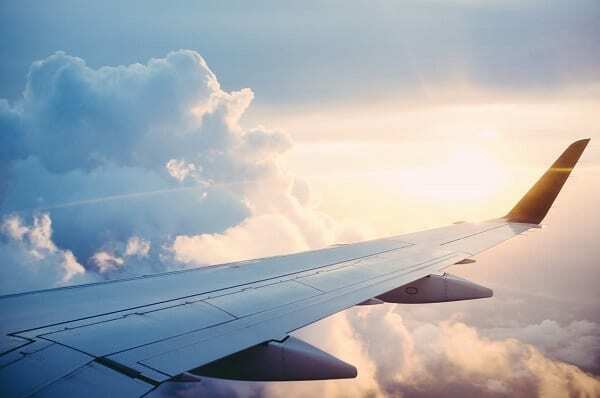 You may have heard that flights are cheapest if you book on a Tuesday; however, this isn’t always the cheapest day to fly. In fact, it changes. Look at a monthly view of flights and prices when searching to find the actual cheapest day to fly each week. If you’re flying somewhere that usually requires a transfer, see if booking your connecting flights separately and by yourself could be cheaper that what an airline is offering to bundle the flights. Of course, you should be very careful not to plan your layovers too close together to avoid missing your next flights. To be safe, you should book them to be at least several hours, if not a day or two apart. As a bonus: you could schedule your flights for an extended layover of a few days. This way you could travel to two places for the price of flying to one and get some extra adventure in between. If you are willing to go without a little extra leg room and in-flight food or drink service, budget airlines offer much lower prices than the big commercial airlines. But, they’re cheaper for a reason. They often have strict rules for luggage, or other requirements like printing your own ticket. Make sure you read and follow all of requirements carefully, or face extra fees that will defeat the purpose of your cheap ticket. Compare the differences in fare when you change your search to different airports near where you are or want to go. The price can change significantly depending on which airports you fly out or in from. The savings might still be worth the extra cost of a rental car if you need it to get to your destination. Airfare tends to only get more expensive with time. So you should grab the best deal you can find as soon as you know when and where you’re going. When flying in a group with a few family or friends, or even with just two people, think twice before buying all of the tickets in one transaction. First, check the price of the ticket for one seat. Then, check the price per seat if you enter more people in your search. Sometimes there is no difference. Other times there is a small price difference. But, every once in a while there might be a huge price difference. Double check this first because the extra step could save you a lot. For popular vacation destinations, you can save a lot by planning your trip during the destination’s off-season. Maybe you didn’t think you could afford a trip to Hawaii any time soon, for example; but, going in late spring or early fall might make it within reach. It’s not only cheaper, but an off season will also be less crowded with tourists. This is another small sacrifice you can make to save on airfare. A red eye flight departs late at night and arrives early the next morning. For obvious reasons, these flights aren’t as popular and are usually cheaper. If you’re a more free-spirited traveler, this could become your new favorite way to see the world. Instead of planning a trip with a destination or a time in mind, browse deals and plan a trip around that instead and schedule your vacation time around it. By being more flexible with the time and/or place, you could snag some of the best deals. And, by being open to different destinations, you could discover amazing places that you would have never thought to go on your own. Travel websites like TripAdvisor, Kiwi, Skyscanner, Google Flights, JetRadar and others are great to compare lots of airlines at once to get the best prices. However, don’t overlook the websites of airlines themselves. Airlines often host their own exclusive sales that the sites listed above don’t have access to. This way they can save their best prices for their own websites. After you book a trip, look up the same flight the next morning to see if the price of the airfare fell. If it did, give the airline a call to see if you can cancel and get refunded for the flight you already bought, then rebook it to get the new price. Many airlines will let you do this up to 24 hours after a purchase.